There have been USB powered aquariums before, but the ones I have seen used fake fish. Instead this handy little aquarium can hold real fish to keep you entertained throughout the day. Plus, to sweeten the deal a little it organizes your desktop accessories and offers a little bit of light. All around it’s a pretty serious multi-gadget. Alongside the aquarium is an LCD screen that features a calendar, time/date, week info, temperatures, alarm with snooze, countdown timer and some built-in nature sounds. In addition to all of that is a handy little overhead light. The inside of the tank has multicolor interior lights and gravel filtration. These are set to be released halfway through October. At that point Fascinations intends to sell these in bulk for $20 or individually for about $40. Entertaining throughout the day? Not for the fish! This little fish torture instrument is all except entertainment for the fish in it and for animalfriends, it is more a thorn in the eye when we see this anywhere. This fish confinement article is first rate animal abuse, could you please not advertise for these kind of animal prisons anymore? How is it cruelty against animals? its amazing haha, im defo going to buy one!!! Cool idea, but…that’s just terrible. Would you seriously try to keep a fish in that? It will DIE within a week. Imagine being stuck in a cubicle for your entire life. That’s…..pretty damn close to what’s going on here. Man, this is something I would have loved back in college. 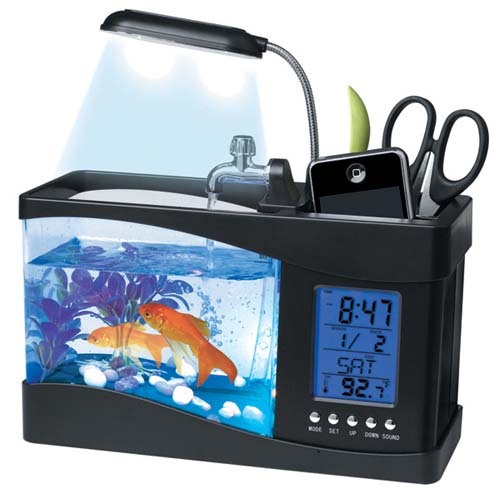 Has a clock, calendar, pencil holder, and a nifty desk-sized aquarium. And to all those naysayers: Really? Worried about the emotions of a fish? ^ *Sigh* now this is where I/we get called hippies. Yes, In a way, I am worried about the emotions of a fish. I am worried because it is cruel for the fish to live in such a small environment; where the water conditions become too toxic for it to live in (ammonia levels probably spike overnight). It’s like living in the front seat of your car, with the windows open maybe 1/18th of the way. In general, most fishkeepers just see it as highly cruel to the fish, and this is why we do not like it. Plants on the other hand, I feel are perfectly acceptable in there. @Fungelstein, You wouldn’t want to be in there would you, have some compassion. I am concered about the fish too. they should be kept in a well state of manner, as they are creatures – harmless creatures. and YES I worry about the emotions of a fish , because I have kept them for decades and my fish live for decades in happines.. if you dont care about them dont get one! @dd6670 – You cannot compare this tank and Walmart. The tanks at Walmart are *not* a fish’s lifelong home, and they have some serious filtration to maintain the water quality to ensure the fish stay as healthy as possible before they’re sold – it’s a temporary place for them to live, whereas this is being sold as a full-time home. The people who put fish in vases are just as bad as the people who keep fish in here. Just because it ‘could be worse’ does NOT mean it’s okay. Especially the goldfish shown in the display picture. Those are POND FISH. Want to keep them in a tank? Hope you’ve got room for a 100 gallon tank with filtration for 200. I’m not even kidding. a betta can live in this just fine! or even a little fish like a guppy! bettas need very little space and can thrive in an 8oz cup!